Irish bats are all small, most only weigh about 5g and none weigh more than about 12g. That’s less than about three little spoons of sugar (or three 5c pieces). All Irish bats are brown in colour, although some have white bellies. Irish bats all eat insects. They are insectivorous. 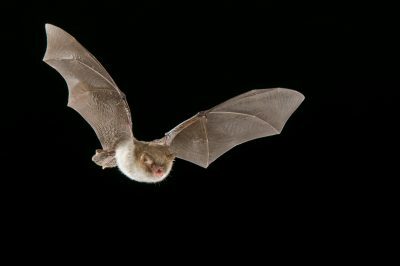 The bat in the picture is an Irish Lesser Horseshoe Bat. The only places in Ireland where you can find bats that eat fruit are the zoos in Dublin and Belfast. The bats that are kept in both zoos are Rodrigues Fruit Bats, which come from a tropical island in the Indian Ocean. Where a bat lives is called a roost. 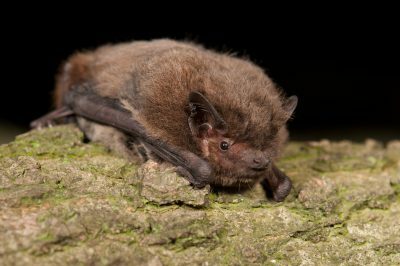 In summer Irish bats have been found living in attic spaces, barns, churches, under bridges, in trees and in bat boxes. They can even sometimes be found roosting in cracks in stone walls. A group of bats that roosts together is called a colony. When bats are in a roost they do not build nests and they do not chew through wood or anything else. They just hang up. Bats like to live in warm places during the summer, attic spaces get really warm. A mother bat has one baby around June. The warm roost helps keep the babies healthy and gives them a good start in life. The mother bat feeds her baby with her own milk, like all mammals. A bat baby is called a pup. The pup is born blind and furless. It opens its eyes after just a day or two and grows fur within the first week. It drinks milk for the first few weeks of life but then it learns to fly and catch its own insects to eat. Bats catch insects to eat in darkness by using sound. They make high pitched squeaks and listen for echoes. This is called echolocation. Irish bats eat insects - the only places in Ireland where you can find bats that eat fruit are in the zoos in Dublin and Belfast! There are nine different types of bats found in Ireland. Some of these are found all over the island of Ireland, while some are just found in some places. This species is one of Ireland’s smallest mammals. 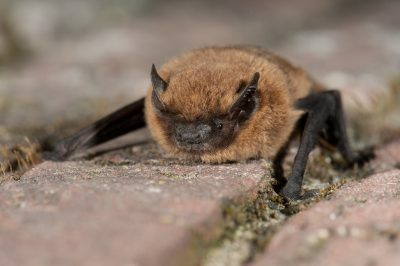 The common pipistrelle has small ears and brown fur. It looks very similar to the soprano pipistrelle. These bats are fast and can make quick turns while chasing insects. The easiest way to tell these two species is apart is by listening to their echolocation calls. The common pipistrelle makes lower pitched sounds than the soprano pipistrelle. 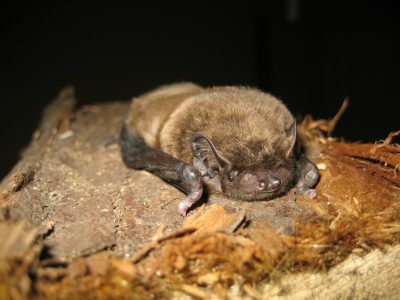 The soprano pipistrelle is, like the common pipistrelle, one of Ireland’s smallest mammals. It has small ears as well as a small body and it makes fast turns when hunting for food. It is difficult to tell apart from the common pipistrelle but its echolocation calls are more high pitched. This bat is also a fast flier but is not as good at making turns as the other pipistrelles. This bat can also fly long distances and migrates from northern to southern Europe in the winter. In Ireland it is mainly found in the north near Lough Neagh. This is Ireland’s largest bat. It has round ears and short fur. 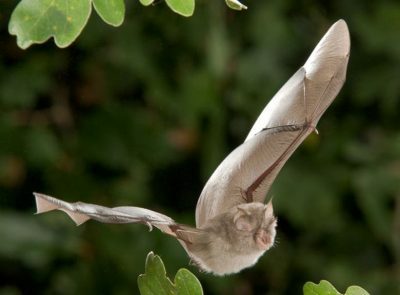 This bat flies higher than any of the other species and has narrow wings which it uses to fly very fast. This bat sometimes eats insects that swarm around street lights at night. 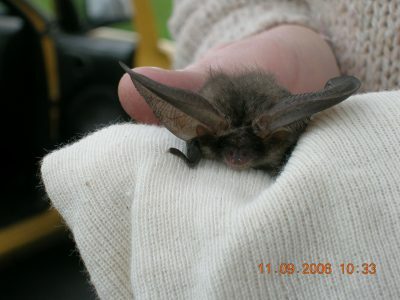 This is a medium sized bat with short ears and long feet. It flies low over rivers and lakes when hunting insects, and sometimes picks up insects from the surface of the water. These bats sometimes roost in bridges. It does not like flying near street lights, it prefers to fly in darkness. Whiskered bats are very small bats with medium sized ears. They have brown fur on their backs but their bellies are quite pale. Whiskered bats like to fly and eat insects in woodland. These are one of Ireland’s rarest bat species. 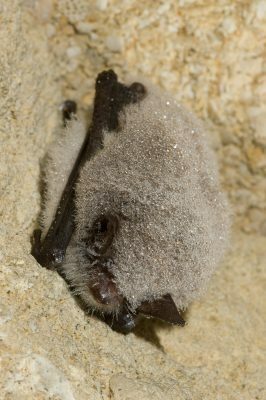 Natterer’s bats have long ears with brown/grey fur on their backs and white hair on their stomachs. 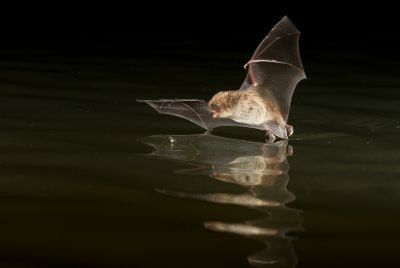 These bats are able to make quick turns and can even hover over insects on the ground before swooping down to eat them. The brown long-eared bat has very, very long ears! It is medium-sized and has big, broad wings. It can hover slowly and quietly. The brown long-eared bat has excellent hearing – it can even hear the sounds of insects crawling on leaves! It likes to fly around trees and woodlands. This species of Irish bat stands out from all the others because of the shape of its nose. It has a nose-leaf (a fold of skin) around its nose. It uses this to make its echolocation sounds. The lesser horseshoe bat is very small and it prefers to fly close to hedgerows. It is the only Irish bat that always roosts hanging freely upside down. It is only found in the west of Ireland. 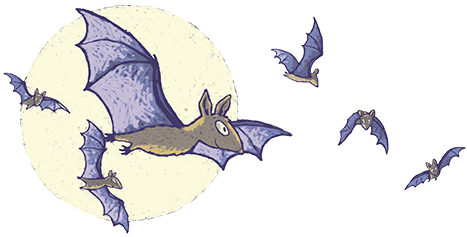 Now that you have finished reading all about Irish bats, see if you can answer the questions in this worksheet!